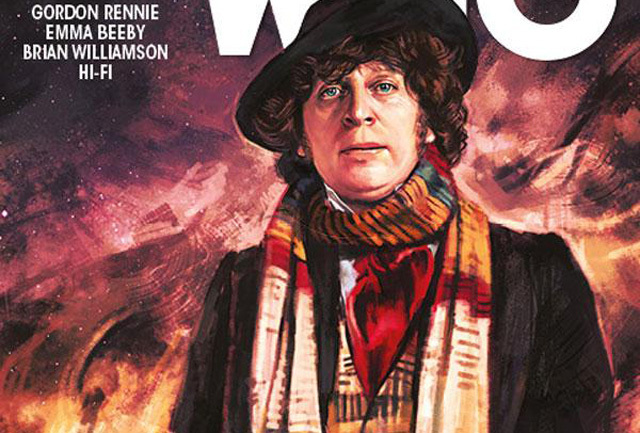 Titan Comics: Doctor Who - THE FOURTH DOCTOR #1 Review | Warped Factor - Words in the Key of Geek. Tony’ll be behind the sofa if you need him. There are events in a modern Who-fan’s life that carry a charge of excitement right from your eyeballs to dance up and down your spine and, like a slightly dodgy 1970s visual effect, turn you into a squealing eight year-old all over again. Tom Baker joining Big Finish was one of those moments. Probably, for the younger Tardis-tykes, David Tennant joining Big Finish will be another. 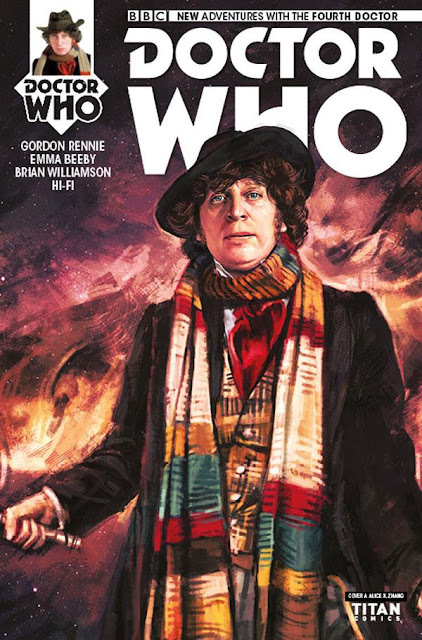 Prepare yourself for another shiver of electro-static joy and nostalgic connection, because the Fourth Doctor is in comic-books again! What’s more, there’s none of the ‘inventing companions to have comic-book adventures with’ malarkey so often necessary. No no, oh my geekbrothers and nerdsisters, this is the real deal. The dream team. The Fourth Doctor and Sarah-Jane Smith are back on the case in two dimensions, and big hairy men up and down the country and all around the world have a little tear in their eyes and are tempted to snuggle up behind their sofas with their Doctor Who scarves and a favourite teddy bear, to digest every single glorious panel of their adventures, helping them beat their enemies with their concentration. It’s Saturday night in the mid-seventies again, and everything’s right with the world. If you think there’s no point to this nostalgic ramble, you clearly haven’t been paying attention to fandom for the last forty years. Releasing a series of Fourth Doctor comic-books carries an enormous hit of nostalgia, and that’s important in terms of selling it. Every Doctor had their unique skills and selling-points: Hartnell the mystery and the avuncular grandfather. Troughton the clown with the Beatle haircut. Pertwee the handy dandy ‘Hai!’ karate man. But when Baker took the role it was the first time it felt as though, just possibly, the Production Team had found a real alien to be the Doctor. For the next seven years, that infinitely-bescarfed, goggle-eyed, sudden-smiling alien was our lodestone in an increasingly scary universe. He was the Doctor as long as any two other incumbents put together, and there’s a sense in which he’s still twice the Doctor almost any other Doctor has been. But more than that – it was in Tom Baker’s era that Doctor Who in comic-books became a serious proposal. He was the Doctor when Doctor Who Magazine was launched, and he played a large part in there being enough of an audience for it to exist in the first place. He was the Doctor in whose world Abslom Daak was born. The Doctor of the Iron Legion. Try as you might, you can’t name comic-book stories before Tom Baker’s era that were as serious, as intensely drawn, as unsentimentally grown-up, or as cleverly fun, as anything that came during his time. I’m as much of a fan as anyone else of the great Dalek comics of the sixties, but the Tom Baker comic-book era was a real quality-Rubicon. It informed the aesthetic understanding of generations of fans, and gave them a sense of what the realistically-drawn science-fiction universe could look like, beyond infinite shiny cities and golden-balled Dalek Emperors. So – no pressure, then, Titan. Annnd go! Gaze of the Medusa, Part 1, in some ways, takes no chances with the legacy either of the comic-book Fourth Doctor or the on-screen version, and there’s a sense of perhaps printing the legend for a wide range of fans from all eras just tuning in or catching up with this ‘Governor’ of incarnations. The Doctor’s in Victorian London, wearing his Talons of Weng-Chiang outfit, taking Sarah-Jane to see the Wild West Show of Buffalo Bill. So there are visual lodestones to cling to, dabble-fans, and a scenario that plays to one of Baker’s most well-appreciated stories and looks, as well as a touch of Western action to draw in the transatlantic trade. But what else is there? Plenty, as it happens. There’s a veiled women who probably isn’t Madame Vastra, but who does a neat line in creepy-as-hell. There are gibber-speaking mono-optic giants with vision-beams (because why wouldn’t there be? ), and there’s an intrepid duo of possibly-Victorians, a father and daughter team with Greek names and an intense interest in ‘chronautology.’ That’s time travel to you and me. The storytelling structure from Gordon Rennie and Emma Beeby (seriously, how do you get a gig like this?) is reminiscent of classic Tom Baker stories, the alien creepiness showing itself first, before a switch to incongruous Doctor-and-companion action, a run-in with alien thuggery and human friendliness, a companion-kidnap and a plan to rescue them. You couldn’t get more mid-seventies than this. Sarah-Jane doesn’t twist her ankle here, but is extracted from a London street by one of the one-eyed gibber-giants, coming over all King Kong to her Fay Wray. The tone of the dialogue is pure Hinchcliffe-Who too – the chronautology-enthusiast father and daughter acting, at least in this opening episode, like a more clued-up Jago and Litefoot, the Doctor stepping out in front of their would-be assailants and delivering his own fine line in alien gibber, though (and for this we’re oddly grateful, as it would feel like one step too far into the territory of hitting marks) refraining from offering them a jelly baby. Perhaps most crucially, the veiled woman is still enough and says little enough to convince as a potential (but by no means certain) villain of the piece. When she and Sarah-Jane are alone, her knowledge is almost prosaically delivered, with a twinge of dangerous humour, that culminates in an absolutely classic, 100% with extra gothic sprinkles effective cliff-hanger that actually makes you shudder, even if you’re 40-odd and beardy and really should know better. That, friends, is the mark of effective Who-writing. It's also of course, given the comic-book format, the mark of effective Who-art. Let’s talk about the art for a minute – there’s plenty to say. Brian Williamson steps up to the plate for this gig, which as we spent a few hundred words explaining, is loaded with traps and ways to fail, ways to let down the legacy. It would be difficult to argue that he does. Again, the Victorian setting is both a gift and a restriction – there’s plenty of room for grubbiness of streets, fantastic architecture and a glorious intensity of clutter, and Williamson delivers that atmosphere expertly. One of the cardinal errors that lays open to an artist on the Fourth Doctor comics is getting close to Tom Baker, but not quite achieving him. There’s no need to worry on that score here though – Williamson delivers a range of Baker expressions, some of which you’ll have seen before, and others which simply smack of Baker’s Doctor as he would be in the scenarios he encounters here. Sladen’s Sarah-Jane too is pretty faithfully rendered into two dimensions, meaning the nostalgia hit never wavers by way of careless companion-art. Williamson is to be congratulated too on the scale and clarity of his eye – delivering monstrous bearded one-eyed trolls (given the Grecian theme, one is tempted to say Cyclopses) with aplomb, and fitting them into the otherwise ordinary scale of Victorian London, adding some horse-related action sequences, both in the Western show and with a London cab, and, for instance, imbuing the clutter of the chronautologist’s lab with a clarity and sharpness that allows nothing to be background, that makes every thing something real, as though it could be the star of its own life story. His delivery of the veiled woman’s house too is realistic, carrying a certain Gothic heaviness in tone and grain that informs our brains of where and when we are. And – did we mention this? – he draws a mean cliff-hanger. Colour work here is by established colourist Hi-Fi, so you know this issue’s got the tones right to invoke both creepy Victorian streets and the brightness of contrasting moments at the Western show, in the chronautologist’s lab and when showing the actions of the cyclopses. So – one to buy then? Is Tom Baker the Doctor? Really, it’s that much of a no-brainer – of course you’re going to buy this one, because Tom Baker rules all and in very many ways, he still informs what’s essential Doctorish behaviour to this day, meaning on some level Tom Baker will always be the Doctor, and the Doctor will always be Tom Baker. The nostalgia is strong in this one, delivering more than a pang in every Sarah-Jane panel. If the first issue grounds us in a very safe world for the Tom Baker incarnation, there’s certainly enough that’s new to make it a very different trip to Victorian times. The art is crisp and intensely textured, the mystery intriguing enough to draw you in, and the Greek connection makes you look forward to even madder things to come. From your first ‘Woohoo!’ at the cover to your fist-pump at the cliff-hanger, rejoice, geeks of the world – the Fourth Doctor is back in comics!